This CD preserves the CBS broadcast of one of the most celebrated of conducting debuts. 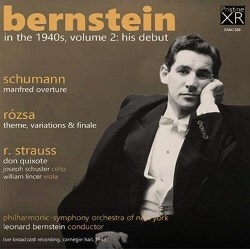 On Sunday 14 November 1943 the young Leonard Bernstein replaced an ailing Bruno Walter to conduct the Philharmonic Symphony Orchestra of New York in an afternoon concert which was broadcast live across the USA. Not quite the entire programme is included here: the concert ended with the Prelude to Wagner’s Die Meistersinger, which was not broadcast. Bernstein had been appointed as the orchestra’s Assistant Conductor a few months previously by the incoming Music Director, Artur Rodzinski. The role required him to sit in on all rehearsals and to learn all the scores so that, if need be, he could deputise if Rodzinski or a guest condutor was indisposed. It’s highly appropriate that this recording should be issued in the Bernstein centenary year. However, I think Pristine are not quite correct in making the statement that “it seems to have escaped any commercial release until now”. The New York Philharmonic issued it on their own label as a CD in 1996. I saw a second-hand copy once in what was then my local CD retail shop. In those days I wasn’t quite as interested as I now am in historic recordings so I let it go and I’ve regretted it ever since. I’m delighted, therefore, that I now have the opportunity to hear this bit of musical history. This was a Sunday afternoon broadcast concert. Based on information I gleaned when reviewing a Pristine issue of two 1955 Guido Cantelli concerts, I think I’m correct in saying that the concert on 14 November 1943 would have been the third outing of this programme. Therefore, the orchestra would have been ‘settled’ with the music. Nonetheless, it was a prodigious achievement on Bernstein’s part to take over this concert at a few hours’ notice without any rehearsal: no matter how ‘settled’ the players may be with a programme a conductor can’t simply walk onto the platform and replicate another conductor’s way with the scores. Furthermore, all the pieces in question are extremely tricky scores, full of traps for the unwary. Pristine reproduce a report of the concert carried the following day by the New York Times in which we learn that Bernstein was told the previous evening that Walter was unwell and that he might have to step in. The press report quotes Bernstein as saying that he stayed up until 4.30 am on the Sunday morning, studying the scores. However, in his detailed 1994 biography of Bernstein, Humphrey Burton paints a rather different picture. The late-night part of the story is true but, according to Burton, Bernstein stayed out late at an after-concert party thrown by the singer Jennie Tourel and subsequently told a reporter: “It’s not true I stayed up all night studying”. At breakfast time on the Sunday morning Bernstein got the call to say he would be on duty that afternoon and there was just time for him to visit the bed-ridden Bruno Walter for a quick tour d’horizon of the scores. Even for so confident an individual as Bernstein it must have been a daunting proposition to walk out onto the Carnegie Hall stage that afternoon, not least in view of the hard-nosed reputation of the NYPO. But perhaps fate gave him a helping hand. As it was war time, the first music played was not the Schumann overture but rather The Star-Spangled Banner, which the audience sang. That may well have helped to settle the debutant’s nerves. Pristine retain this, along with the radio introductions, and though they’re separately tracked – which is sensible – I think it’s good to let these announcements play as they give a period flavour. At the end of the disc we can even listen to the wartime news headlines. The Schumann overture goes well and there’s plenty of dynamism and turbulence in the quick music that lies at its core. This is by no means a dutiful run-through of the piece. Miklós Rózsa’s Theme, Variations and Finale was originally composed in 1933 and was revised in 1943. I presume that it’s the revised version that was played on this occasion because on the website of the Miklós Rózsa Society the original score is listed as Op 13 while the revised version is listed as Op 13a. (Incidentally, the piece was further revised in 1966.) The theme, which is heard on an unaccompanied solo oboe right at the start, has the feel of a folk melody though I believe it’s an original theme. There follow eight variations and the finale, the latter being the longest movement. Helpfully, all sections of the work are separately tracked. The variations are colourful and interesting, though the score sounds far from straightforward to conduct. The performance is often very spirited - as in Variation 3, for example, or the exciting finale. Bernstein builds Variation 4 to an impassioned climax. The following variation calls for – and here receives - significant orchestral dexterity. There are times when loud passages are somewhat distorted – Variation 7 is a case in point – but overall the listener gets a very good impression of the performance. In Don Quixote the main characters were portrayed, as the composer intended, by principals from the orchestra. Joseph Schuster (1903-69) had been the solo cellist of the Berlin Philharmonic from 1929 to 1934 and when he emigrated to the USA he was snapped up by the New York Philharmonic, whose solo cellist he was from 1934 to 1944, after which he pursued a solo career. His Sancho Panza was William Lincer (1907-1997) who had been principal violist of the Cleveland Orchestra but then followed Artur Rodzinski to the New York Philharmonic, where he served as principal violist from 1943 until 1972. Both musicians play very well indeed in this performance. They are nicely balanced against the orchestra and their playing is characterful. It’s not always possible to hear the viola solo too clearly in performances of this work but here Lincer’s winning playing comes through extremely well. Schuster receives the degree of prominence that his role requires and he makes a fine Don. I was particularly taken with his eloquence in ‘The Knight’s vigil’ variation and he portrays the death of Don Quixote with noble poignancy. This work is a testing piece right from the off, requiring virtuoso and mature stick technique from the conductor. The 25-year-old Bernstein rises to the challenge with aplomb, laying out the textural and motivic complexities of the Introduction most connivingly. ‘The Ride through the Air’ is exciting, despite the sonic limitations, while the gorgeous thematic variant at the start of the ‘Dialogue of Knight and Squire’ sings out ardently. The ‘Death of Don Quixote’ – and the skirmish that precedes it – is very well done, while Bernstein brings off the delicate close very well indeed. Don Quixote is a really complex, demanding score, and it’s Bernstein’s great achievement that he does far more than hold the work together; this is a genuine and vivid performance. No wonder his debut caused such a sensation. Musically, then, this disc is very well worth hearing and Bernstein devotees will welcome this release. Andrew Rose says of the source material: “The recording was made onto acetate discs from an off-air source, thus is of 1943 broadcast quality.” Inevitably, the 75-year-old sound has its limitations but I think the transfer has been done skilfully and at no time did the age of the recording get in the way of my enjoyment of the concert. Rose goes on to say “[I] have done what I can with the condition of these elderly and somewhat worn discs. A handful of very short patches were required in two of the works to cover very short gaps in the source recording - these five patches have been digitally aged from more recent recordings to make their appearance as seamless as possible. Some surface noise inevitably remains and can be heard at different levels throughout the recording, parts of which are excellent considering the source, others less so.” That’s all commendably honest but I can truthfully say that the patches to which he refers have been done so unobtrusively that I didn’t notice them. Overall, I think Andrew Rose has worked his customary and painstaking magic. Don’t let the age of the sound deter you. This is a genuine moment of musical history when the possessor of a prodigious conducting talent seized the moment and thrust himself into a spotlight which, in truth, he was never to relinquish over the next five decades.